When you’re marketing your small business there are two options. Spend a lot of money with little time investment. Invest a lot of time but spend little money. For most new businesses, content marketing is a great way to approach the second option. Finding clients for your small business is one of the first challenges you run into when starting out. Content marketing is the solution for many small business owners to help grow their online presence in those early days. Unless you have the budget, the question of organic vs paid marketing is usually out of the question. This is all about the best way to start out where time is more plentiful than money (though admittedly time is never plentiful). Content marketing has amazing opportunities for generating leads for your small business with the right approach and content. Before you can even start finding leads you have to understand what a valuable lead is for you. There are leads and then there are valuable leads. You don’t want just any lead for your small business. A lead that has no need or no interest in your product or service is a lead that’s useless to you. There’s nothing worse than wasting time and money on a lead that will never have any value to you. What is a lead that’s valuable to your small business? They’re in your target audience. There’s interest in your product or service. It takes more specific targeting to reach a valuable lead as opposed to a lead. Many companies will deliver leads for a cost per lead fee but they won’t tell you if the lead is targeted or just a warm body you can contact. A person, real or not, has no value to your small business unless they’re of value to your business. If a lead doesn’t match at least the criteria I laid out above then they won’t bring value to you. Knowing the difference between a lead and a valuable lead will help you find valuable leads and understand their value better. Calculating the value of a valuable lead as opposed to a lead isn’t very accurate. You can calculate the cost per lead by dividing the total invested in getting the lead by the number of people reached. For example, if I spent $1000 on advertising and I got 150 people subscribing to my email list, the cost per lead would be $6.67. That doesn’t tell me much though because how many of those subscribed are actually going to turn into a customer? Did I reach the right people with my advertising? That will determine if they’re a valuable lead or not. If only 2 of those 150 people ever become customers then the leads that converted cost you $500 per converting lead. That doesn’t look that amazing but it depends on your industry. Improvements can be made though. A valuable lead might cost a little bit more than the 150 people you initially reached. With proper targeting, you might only get 75 leads which comes out to $13.33 per valuable lead. What if of those 75 leads 4 of them turned into customers though? That’s a lot better because the valuable leads who converted only cost you $250 per converting lead. Assuming in the customer lifetime you earn the same amount among new customers then you’re going to make significantly more money with a valuable lead than a lead because of the smaller cost to obtain a new customer. The value of a lead can vary dramatically from industry to industry and so can the cost to obtain the lead. Restaurants and retail might have a lower cost to obtain a lead but it can take months to generate enough income from the lead to justify the cost. For a marketing agency the cost to generate a lead may cost a significant amount of money but enough income could be generated within a month to justify the cost. Any way you look at it, it’s important to understand that the value of a lead doesn’t come from how much money they spend with you in the beginning. The value of a lead is in the lifetime value of a lead. If the lifetime value of the lead far outweighs the initial cost to obtain the lead, you’ve got a winning formula. For example, generating a lead in retail often has a high initial cost which amounts to more money than the lead will probably spend on their first visit. With great customer service and a marketing plan that doesn’t let customer relationships fade, once a lead becomes a customer they’re likely to spend more money with you. If you’re bringing that customer back to your shop again and again then you’re going to pay for your initial lead generating costs plus make money. Valuable leads may cost a lot of time and thought to find with content marketing but those leads are likely to turn into customers. Small business content marketing has a higher likelihood of bringing in valuable leads than other means of marketing. Because when you create great content that’s created just for your customer you’re creating content that’s highly targeted for valuable leads. When you bring valuable leads into your business you have a high likelihood of converting them into a paying customer. When content marketing is done right you’ll end up with content that’s helpful to people and continues to bring them to you as valuable leads well after the initial burst of interest. Paid advertising will stop bringing you leads the minute you stop paying for them. Content marketing will continue to bring you leads as long as you have your landing page available and there’s interest in your content. You just have to make sure you’re creating great content. If you find people of your target audience and have great content then they will turn into leads. Leads who have expressed interest in your business and are exposed to your brand are more likely to spend money at your business. Even advertising has a hard time converting people into leads without great content to help convert them. That’s why you see many companies advertising their content rather than trying to get people to buy something. With small business content marketing, you can find leads and turn them into customers. If you are like most small bussinesses just starting out then you have more time than money. Of course time is still short. Creating great content doesn’t have to be a complex and time consuming task. That makes it easier for you to benefit from small business content marketing. Sometimes it takes a bit of creativity and conversation to figure out what people would be interested in. If you make a product then your content could be as simple as showing how you make it. That could be photos of the process with a short description of each step or even a video slideshow which can easily be produced on website like Animoto. You don’t have to do anything overly complex either. You could create social media posts each with a micro-lesson to help people who are interested in what you do. Just make sure you’re reaching your audience with proper ad targeting or choosing a social media niche. 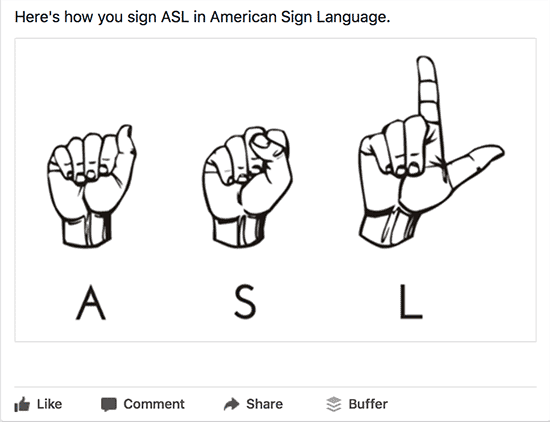 I’m currently working with a client who teaches ASL (American Sign Language) and she’s starting her Facebook page. A great option is to post short lessons how to say one thing in ASL. Each post could be one simple image with just a few words. Starting with how to sign ASL, posts can go into more details but still kept very simple with a common theme. One post could focus on the theme of family and the next on household items. It can be that simple to expand interest in learning the language. Posting an image with no text and asking fans to decipher what it means is a great way to engage your audience. Another example is a cleaning service who shows how their process works. Never feel like you’re giving away your secrets or sharing too much, you get to control what’s shared. Worse than oversharing is not sharing anything in which case you have an impossible time building trust. Small business content marketing is all about creating great content that’s interesting and engaging to your target audience. With great content and putting it out regularly you’ll reach new people online and expand your social media and website presence. It becomes a win-win beacuse you are going to get referals from people that haven’t even been your customer yet! If y0u’re regularly putting out great content and offering people the option of signing up for your email list, you’ll have great connections to people in your target audience. You can even grow your email list by using just social media and an email list, check out my free eBook to find out how. Using your content to get valuable leads always comes down to offering more value than you’re asking for. That’s sort of how it works with all business. If you’re asking for an email address to get a lead, you better offer something good in return. If you’re asking for a phone number then you had better offer something amazing. What you are able to ask for is all depending on the quality of what you’re offering. Whether your lead goes into an email list or to your CRM (Customer Relationship Management) you have to balance the value you are giving with the information you ask for. It always has to be balanced for your audience. If you offer a guide in return personal information be sure you’re not asking for too much. A physical address, email address, phone number, etc. is probably too much. An email addresa and first name might be just right. If you’re offering a highly valuable webinar then you can get away with asking for more information from your customer than if you’re offering an infographic. The less information you ask for, the more likely someone will convert to a lead. Think about the information you absolutely need and don’t ask for a single thing more. 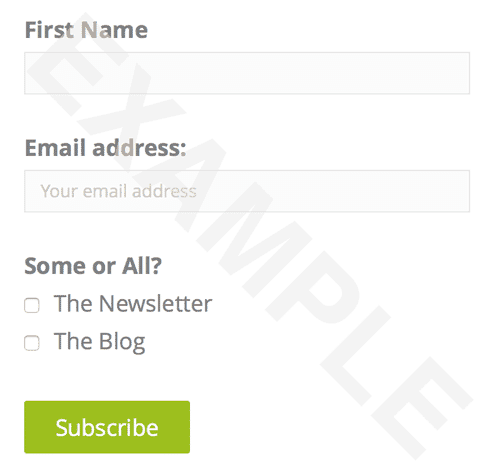 I ask for a first name (to personalize emails) and an email address, that’s it aside from the necessary question of which email list to sign up for. If the content you’re giving away for a lead is desirable and high quality, people won’t hesitate to give up their personal information. Now it’s time to get added value for you after reading this blog post in case this wasn’t enough value for you. One of my best offers is for me to analyze your small business online presence for free. I will put together a custom report just for you and tell you how you’re doing so far. I will also give you suggestions on places you can improve. You’ll get actionable advice from someone (me) who lives and breathes small business online presence every day. I’ll also give you a 30-minute free (but optional) consultation if you’d like. Request your free Online Presence Report now, you don’t even have to sign up for an email list.